Cranes themselves are a very complex business and an array of technical knowledge is usually a pre-requisite to starting and operating your own business. Careful consideration in protecting you business should be no different. In an ever-changing world of compliance, definition and law one must seek out the best and brightest to help keep safe what we work so hard to build. The J. 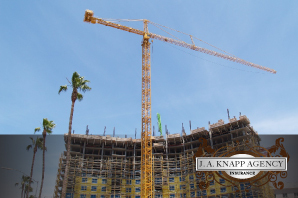 A. Knapp has been in the industry since 1988 with experience and expertise in a number of fields including cranes and equipment rental. Through years of experience and a proven track record, the J. A. Knapp has been able to secure multiple national carrier programs through A’ rated companies adding value and understanding. Coverage is provided and underwritten by not only those agencies that understand the industry but many of which have owned and operated in the same field in years past. Armed with the knowledge and understanding we at JA Knapp would like to offer an insight into coverage areas we offer and help you to understand your needs individually. As you may well know the needs and restrictions involved in owning and operating a crane company are vast and ever changing. Whether you are operating a Full Service Crane Company, Owner-Operated or just Bare Rentals we have the program and understanding for you. With resources available to help keep you in the know and state by state understanding, there has never been a better time to review your coverage and concerns.